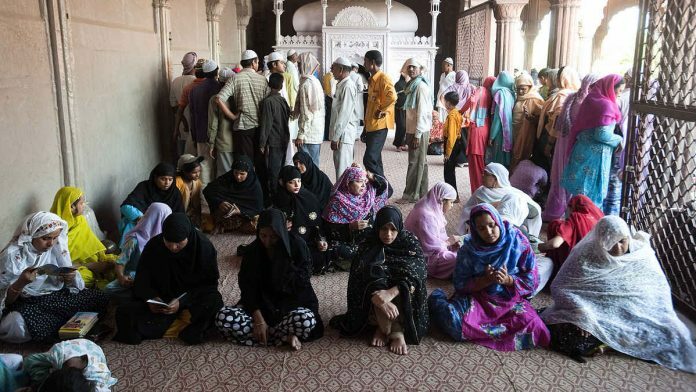 New Delhi: The Supreme Court Tuesday admitted a plea filed by a Pune couple to lift a ban on the entry of Muslim women in mosques. But the fact is that Islam does not mandate any ban on their entry into any mosque in the world. The petitioners have sought directions from the Supreme Court to the AIMPLB, the Waqf Council, the National Commission for Women and the Ministry of Minority Affairs to allow Muslim women to enter mosques and offer prayers without segregation. The petitioners have also sought permission for women to pray in mosques without being separated by a barrier. They have also argued for women to be allowed to stand in front, and in mixed-gender congregational lines. Islam doesn’t prohibit women from offering prayers with men in mosques. Instead, the AIMPLB member said, it directs women — whether at home or in a mosque — to stand in a separate row, some distance behind men. In some mosques, separate areas are built for women to offer prayers. “The only limitation is that women are not supposed to offer namaz while standing shoulder-to-shoulder with men, either at a mosque or at home. It has nothing to do with giving less respect to women,” he said. Ashraf Usmani, spokesperson for Darul Uloom Deoband, echoed the AIMPLB member’s words. “It’s not right to say there’s a ban on the entry of women, because there is no prohibition. It may be ‘disliked’ by a few mosque authorities, but women are not barred,” Usmani said. Nonsense. It is also for their own convenience, privacy and safety also. Just like separate Washrooms, lines in Movie Halls, Railway Bogey’s, Ticketing Counters etc. It has become a fashion to just keep on objecting to each and everything under the Sun these day’s. So much for Equality. Just want the Good things, not the bad one’s or the Struggles men have to endure many a time. Ishi main koi Galti Nahi ho sakta . The print is anti Hindu ,plays propaganda ,promotes ishlam .shame on Ur article biased .